Yoshimitsu Kawakami is the owner of NK-Company, a tuning shop based out of Hyogo Prefecture. If there is one thing you can say about Kawakami it's that he has a very distinct style. He puts a great deal of effort building a show car just to launch it at a wall, sideways and at 100kmh. His S14 is a definitely a show car and has appeared at Osaka Auto Messe, Fukuoka Custom Car Show, and Nagoya Exciting Car Showdown. But don't let the show looks deceive you, Kawakami drove the balls off this thing at tracks all over Japan and even made it into the MSC Challenge finals in it. You may think those are vinyl graphics, but it's all airbrushed. Considering the dangers involved in drifting and the constant body repairs the end up being required, vinyl is typically the easier way to go. Mazoria paint covers the K's FRP Factory full aero kit. The taillights are from R.Y.O. and the diffusers are all custom pieces. The trunk lid is carbon as well. Lots of polished bits and carbon. The cooling panel is from Garage Defend and that's a Trust TD06 20G you see. Both strut towers are covered in carbon, but you may have noticed the LCD screen on the driver's side. It actually works and I've seen it playing music videos. I also like the way that he fed the coolant breather tank directly from the top of the radiator. The interior is as wild as the outside. Fully gutted, caged and painted yellow to match the exterior. 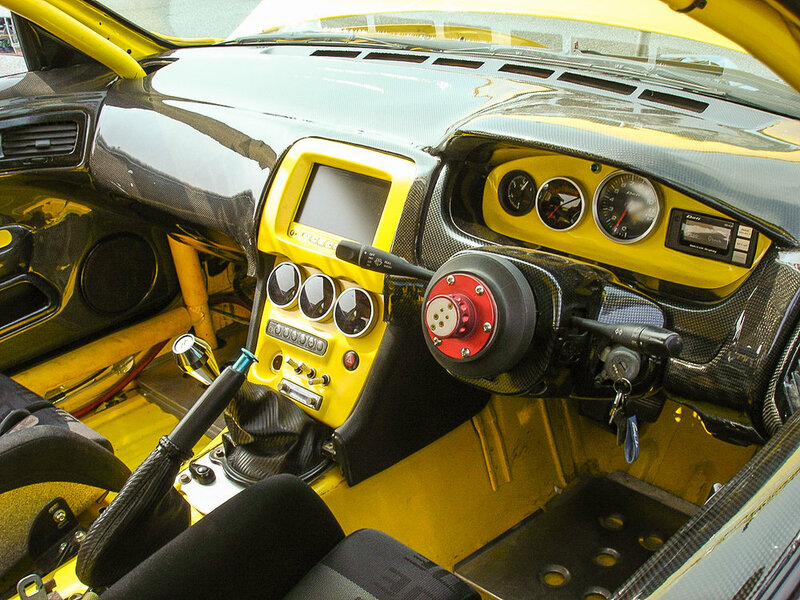 Custom carbon dash, cluster and plenty of meters.